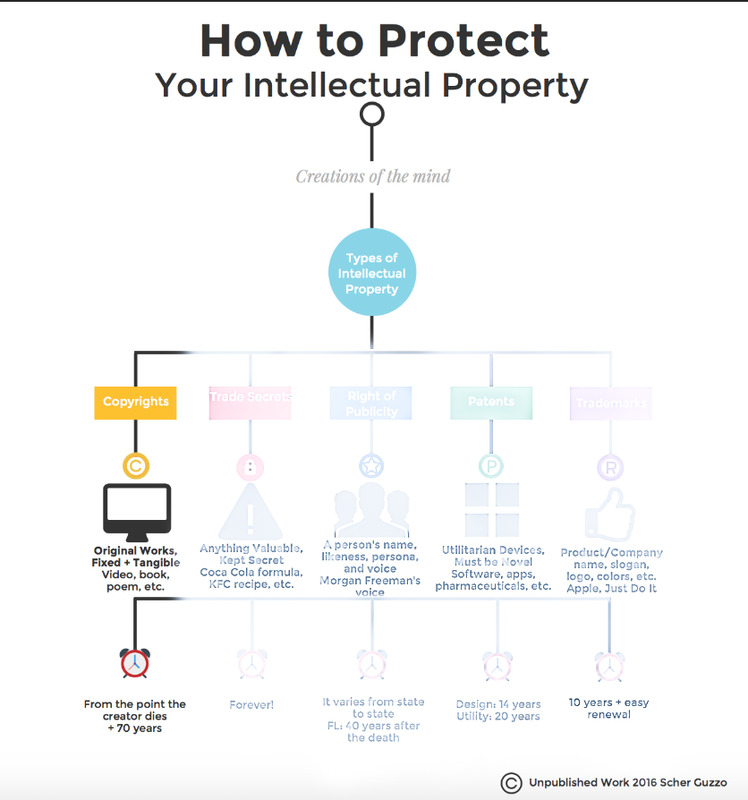 Intellectual Property Basics - Copyright — St. Augustine Law Group, P.A. Continuing our discussion on Intellectual Property and your business, today's blog is about Copyrights. If you've not read our introductory blog on Intellectual Property, CLICK HERE to review it to get a general lay of the land. In general, Intellectual Property deals with creations of the mind. Intellectual property can be divided into a few distinct subcategories, Copyright being just one. Definition: the exclusive legal right, given to an originator or an assignee to print, publish, perform, film, or record literary, artistic, or musical material, and to authorize others to do the same. In short, Copyright is an original work that is fixed and tangible. So my artistic ideas aren't protected? Copyrights extend to the expression of an idea, not the idea itself. If you are looking to protect an the idea you have for a new product, you may be more interested in the Patent. The following is a short list of things that are NOT protected by Copyrights, but may be protectable using a different subcategory of Intellectual Property. Works consisting entirely of information that is commonly available and contains no originality. What are my rights as a Copyright Owner? License the Copyrighted work to third parties for performance, reproduction, or distribution. You may have heard that copyrights last 70 years from the death of the creator. However, there are exceptions based on the type of work, and authorship. You cannot assume that any work is in the public domain unless it was first published before 1923. Anonymous Works/Pseudonymous Work/Work for Hire: 95 years from first publication or 120 years from the year of its creation, whichever expires first. Do I have to register my copyright? In short, technically not. As the creator of the work, you own the copyright to that work immediately after it is created, whether you file with the library of congress or not. However, it tends to be easier to defend your copyright when it has been registered. You can do so at http://www.copyright.gov/. If you aren't sure whether or not you should register your copyright, or have questions about the process, Contact Us today for a free evaluation. Intellectual property can be complicated and confusing. At St. Augustine Law Group, we are here to help you every step of the way. If you have questions about enforcing your copyright ownership, or want to better understand your rights as a copyright holder, Contact Us today! Credit to Scher Guzzo for the creation of the infographic, and assisting in the drafting of this blog post.